August has been a great month for those of us that love creative fighting in marketing warfare. 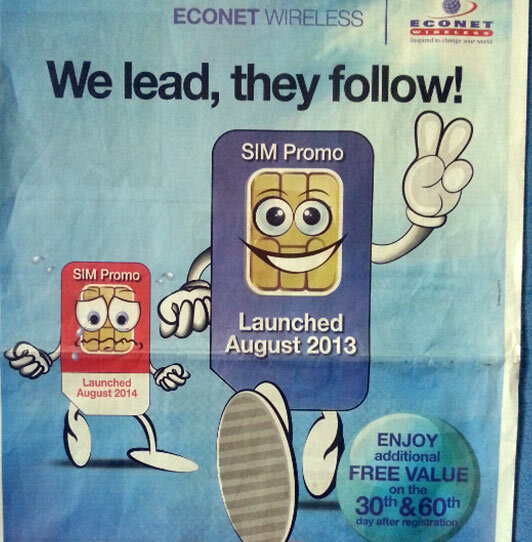 So Econet went first deriding Telecel for copying a SIM Promo they had started. We hope it continues… We hope they try to outdo each other more and more coz we the consumers are the likely winners when this happens! Just curious… which ones is cleverer? Let us know in the comments! Mr Kahiya Econet has become a lovemark to the consumers. nomatter how hard Telecel will try there is only one secret to Econet’s success and if Telecel overcomes that and try to change their way of doing business for sure they will win. Econet has gone beyond being a brand in the Zimbabwean market to become a lovemark. I have observed your comments on TZ for a while now. You hate Econet with a passion, tell me, what did they do to you? Who started this marketing wars between the two? I don’t like where this is all leading. 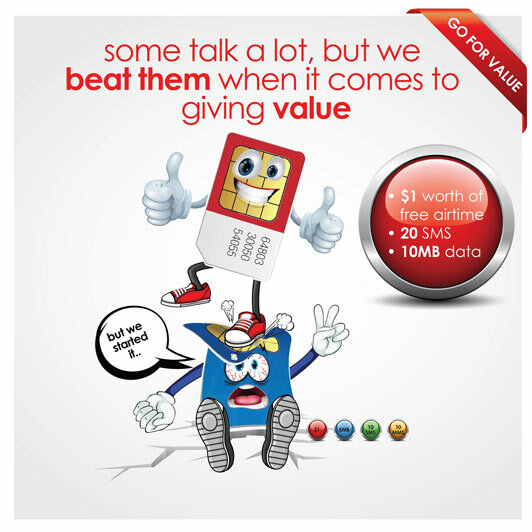 You could have not said it better than that, Econet knows wat they do. Proudly Econet customer !!!!! kkkkkk. Telecel won this one hands down! On another note, Zimbos are struggling but they dnt seem to respond to cheaper services from Telecel, whats going on here? Kwadzinorohwa matumbu ndiko kwadzinomhanyira zveshuwa!!! The switching costs are too high. ECONET has made it difficult to switch to another network. After all their story is even more inspirational than the TELECEL story. Who doesn’t know where they came from, who doesn’t love a fighter. In the end it involves a lot more than just a cheaper service. In the end its about the BRAND. The ECONET brand is much bigger than TELECEL and compares with some of the continental best. Its all about MARKETING period. i have asked this before and i will ask again….. Is Telecel making money? Considering that they are yet to pay Portraz $137mil. Telecel mustnt forget that they are in business to meet needs and making money. Telecel seems in it to just fight Econet, not in it to forge its own path to success. To those that really want to ‘Tell Someone’, please may ‘Someone Tell’ just one innovative product and game changer that Telecel has brought to the table. Well they coined what is now being regarded as juicing your phone when you want to recharge. So yes they have had some clever marketing in the past but it is not consistent. Now everyone talks about kujuicer phone – thanks to TELECEL. Ladies and gentleman the real reason why consumers use Econet is primarily because of Dr Strive Masiyiwa, that man has sacrificed so much for the people of this nation be it in the form of scholarships to our kids, the orphanage he runs and various other people centred investments. That is what Econet rides on fullstop, their service has deteriotated, their charges are ludicrous and customer service questionable. The staff well are not exactly as professional as they could be, Telecel on the other hand goes the extra mile be it service delivery, customer care and related services. Econet has grown to become a lovemark to its consumers, this is one of the brands that when removed from the market the consumers will fight for its comeback. i have seen this brand evolving and i tell you its success is so inspiring. Why is it Telecel is loosing subscribers since the launch of their telecash food for thought. Francis Mawindi and the recently suspended kahiya are the people who can drive telecel to were they want to be. This is now a two horse race and the winner is a company that is always there for its consumers. inspired to change your world. 9 000 000 + Buddies. its more than a friend its a buddie. buddie brought to you by Econet Wireless. i would have to give it to Telecel their marketing team is exceptional its their service execution which is a bit problematic. imagine 90% of subscribers call topping up their phones kuJuicer irrespective of the network they are on. i would disagree with you on that one simply because Telecel DO NOT have any single catchy advert of their own, they wait for Econet to come up with something then they(Telecel) then respond. In other words Telecel are responders and are busy fighting Econet and forget to come up with “game changers”. Which of these service providers has managed to give consumers exceptional service at an affordable price. How many of us can honestly say that 80% of the time they are able to make a call, send an sms or app with both the providers? The other question is why is that you can get similiar services at such price variances. I have both a telecel and an econet line and I keep bouncing from one to the other cause quite frankly they are both unreliable. Both have pros and cons but they should both remember that time is money and nothing is constant and we can opt out of using them both if a reliable consistent service provider would enter the telecoms arena. Personally I think the competition is healthy as it keeps people on their toes and reminds them that the ultimate goal for consumers is to get value for their money.